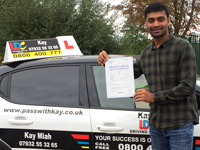 Throughout my time of driving experience Kay has been very supportive and encouraging, he made me feel relaxed and built my confidence each lesson. He understood the targets I needed to aim for and achieve at the end of my lessons. 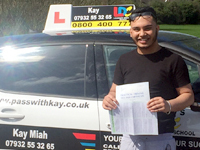 Thank you Kay for making it happen for me I will defo recommend. I’m glad I found Kay. He made me feel at ease and gave me the confidence I needed for going on the road. 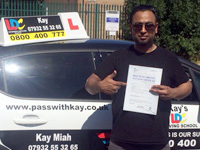 He is a calm, professional and friendly guy, will definitely recommend, thank you for your expertise. 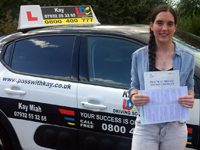 A big thanks to Kay for making it easy for me to pass. He taught me the importance of safe driving and has prepared me well for life on the road. A definite recommandation for anyone. 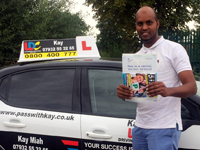 Kay is a great instructor, he is very friendly, patient and informative. I recommend Kay to anyone. Thanks again. 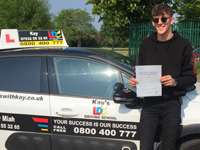 I felt comfortable meeting Kay and build confident from that time onwards, his a brilliant teacher, kept calm and taught me everything to pass first time! Thank you mate! 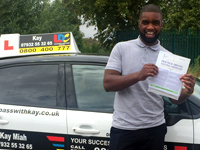 I’m a very first beginner which now a qualified driver. Can’t be any happier and thank you less, I couldn’t of done it without you. You were fun and friendly all throughout the time, you booked me a midway pass course which got me thinking if its enough to be test ready, but of course you had faith in my abilities, encouraged and supported me all the way. I will definitely recommend you to everyone. A 10/10 service! Yet again thank you so much and watch out! see you on the fast lane 😉... Shaz!